The vault has been cracked! Editors Note: There is a photo and video associated with this Press Release. For more than 40 years, Canadians have wondered about The Caramilk(i) Secret – how do they get the caramel inside the Caramilk(i) bar? There are over 13,000 Caramilk(i) fans on Facebook, more than 70,000 people following The Secret on YouTube and hundreds of online urban myths. According to a recent Caramilk(i) survey(ii), we are a country divided. Canadians are completely conflicted over the desire to learn The Secret behind one of Canada's greatest mysteries. 49% of Canadians say they want to know The Caramilk(i) Secret while 51% of Canadians believe that some mysteries should remain unsolved. The Secret has been safely locked away in The Caramilk(i) Secret vault for decades, but now the vault has been cracked! 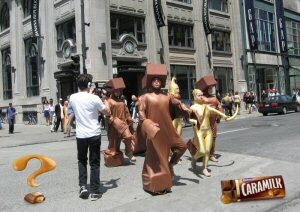 Seen today, exclusively on the streets of Montreal, The Caramilk(i) Secret was revealed! To see for yourself, visit www.youtube.com/watch?v=rj9n1VD8Jtw. To see more interpretations of The Caramilk(i) Secret unveiled, visit www.stillwondering.ca. Headquartered in Parsippany, New Jersey with the Canadian head office in Toronto, Cadbury North America is the Canadian and U.S. combined business of Cadbury plc – a leading global confectionery business with number one or number two positions in over 20 of the world's 50 largest confectionery markets. In Canada, Cadbury is the country's second largest confectionery company and the brand portfolio includes some of Canada's best-loved chocolate, candy, cough and gum brands such as Dairy Milk(i), Caramilk(i), Mr. Big(i), Dentyne(i), Trident(i), Stride(i), Bubblicious(i), Halls(i), and Maynards(i). In Canada, some Cadbury "firsts" include the first 100 calorie chocolate bar (Cadbury Thins(i)), the first sugar-free breath freshening gum (Dentyne(i)) and the first liquid centre pellet gum with dual flavour combinations (Trident Splash(i)). Our people create brands people love with passion, dedication and drive. For more information visit www.cadbury.com. (i) Trademark of Cadbury UK Limited, used under license. (ii) From March 30 to March 31, 2009, Angus Reid Strategies conducted an online survey among a randomly selected, representative sample of 1,003 adult Canadians. The margin of error for the total sample is +/- 3.1%, 19 times out of 20. The results have been statistically weighted according to Statistics Canada's most current education, age, gender and region Census data to ensure a representative sample of the entire adult population of Canada. Discrepancies in or between totals are due to rounding. The Caramilk(i) Secret revealed! 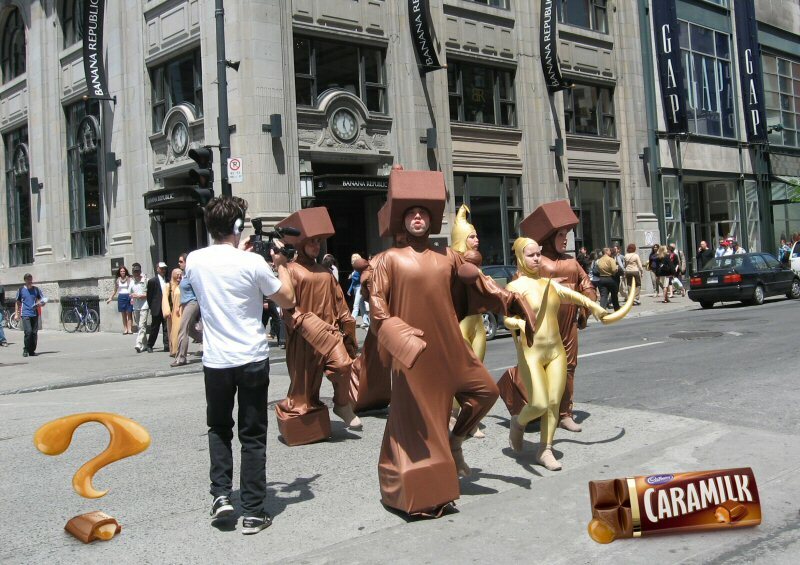 Seen exclusively on the streets of Montreal, Quebec, The Caramilk(i) Secret squad reveals one of life's sweetest mysteries.